Roots harmony trio Tetrack formed in the Mountain View area of east Kingston in the early 1970s, borrowing the name from a local sound system (which had taken the moniker in reference to the Tetrarchy established by the Roman Emperor Diocletian in the 3rd Century). Although Paul Mangaroo was the primary lead singer, Carlton Hines wrote most of their material and was the real figurehead of the group, Hines and Dave Harvey were typically employed as backing vocalists, but each also sang lead. A mutual friend introduced them to the visionary producer Augustus Pablo, leading to impressive debut recordings at Lee Perry’s Black Ark and the stunning debut LP, Let’s Get Started. Despite the album’s widespread acclaim, the lack of ready finance and slow pace at Pablo’s Rockers stable led the group to shift base to Gussie Clarke’s Music Works in 1983, with Hines also being employed as a songwriter for other artists there. 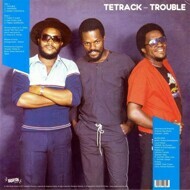 The resultant album Trouble was cut for Gussie with Sly and Robbie, the engineer Soljie and a range of other stellar players, including guitarist Willie Lindo, the material issued in extended ‘disco mix’ format, to make the most of its captivating rhythms, British and Japanese editions complimented its initial Jamaican release.